to ensure that the long-term forest productivity of sites within the WBCF is maintained or enhanced. to use a variety of harvesting and silviculture systems to minimize the delivered cost of the timber products to the manufacturing facility as well as to promote biodiversity in the remaining forests. to manage the forest in a manner that will produce a continuous flow of logs of suitable quality and quantity while maintaining other resource management goals. to conserve sufficient wildlife habitat in terms of the amount of area and distribution of areas for the survival of species at risk. There are 5 red-listed (Endangered or Threatened) and 13 blue-listed (Species of Concern) vertebrate species found in the areas around the CFA. to maintain or enhance mule deer winter range where it is found on the CFA. to protect water quality by ensuring that riparian areas are accurately identified and protected from degradation from harvesting or road building operations. to involve licensed water users in the planning and protection of their water sources. 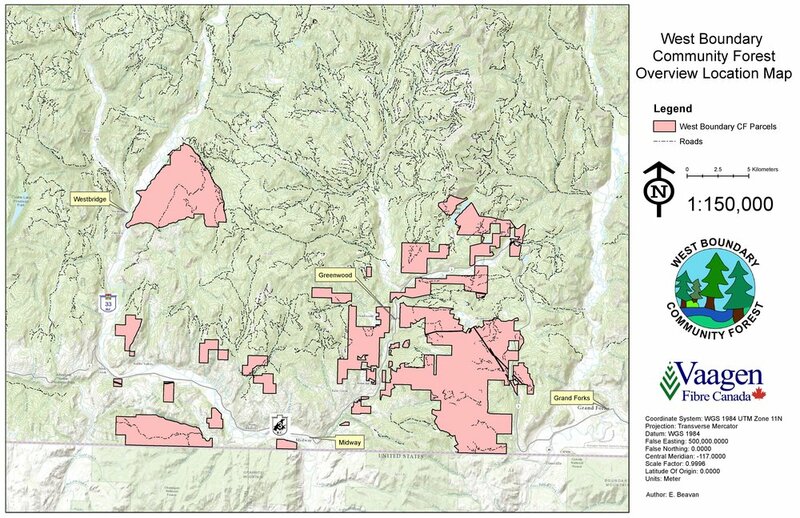 The potential timber harvesting land base in the WBCF overlaps extensively with the scenic corridor declared under the Kootenay Boundary Higher Level Plan Order (KBHLPO). Fully half of the area of the community forest has formal visual quality objectives. These visual quality objectives will be considered and incorporated into harvesting prescriptions wherever site conditions allow.